Some people condemn Groove Metal as “something modern that isn’t Metal” or “a disgusting Metal genre that was created on the 90s”. The ones who say such verbal trash are those uncles from the 80s and their fanatic apostles, but those idiots with a fashioned old school style don’t understand the fact that bands as KING’S X, PRONG, PANTERA and others started the style before the 90s. The genre has many good names on the past and present, like the North American quartet BYZANTINE, from Charleston, who is coming to make your ears bleed with “The Cicada Tree”, their latest album. We can feel that powerful and bitter Southern music scent on their Thrash Metal oriented work, with that thunderous aggressiveness and raw sound on guitars. But be prepared, because they have a total aggressive insight of their music, even with the use of good melodies. Without calling them a clone (because they aren’t), they remember a mix between the raw and groove aggressiveness of PANTERA on “Cowboys from Hell” era with something that comes from DOWN, with very good vocals (both on harsh and clean tunes), an excellent work from guitars, and a thunderous and heavy rhythmic session (bass guitar and drums are really great on the band’s work). So be prepared for their aggressive work. The album’s production is really excellent. The sound quality fits on their musical work in a great form, being clean, aggressive and heavy in the due parts, balancing these elements in a perfect form. So you’ll be able to get the best of their songs with no problem at all. 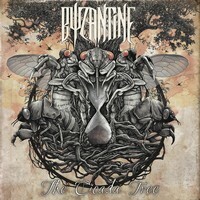 As a result from a very good work on the production and their talent to make music at a high level, we can see that “The Cicada Tree” is really charming. The aggressive Thrash Metal insight of “New Ways to Bear Witness” with its nasty and filthy guitars, the hooking and brutal tempos of “Vile Maxim”, the fine and tender melodies of “Map of the Creator” (even with some aggressive moments, its melodies are really tender and charming, showing an excellent work from vocals both on harsh and clean parts), the slow and bitter song called “Dead as Autumn Leaves”, the oppressive technique shown by the band on “Incremental”, the purely emotional “The Cicada Tree” and long and creative rhythm changes of “Verses of Violence” can be said as their finest moments. It’s an amazing and great album, indeed. But if you love moldy and dusty music, stay away, for BYZANTINE’s musical work bites with violence!